Mom Mom had a sense of style that is hard to adequately describe, but some words which come to mind are: sparkle, glitter, razzmatazz, festive and loud. She was about as subtle as one of Trump’s casinos, and usually favored the same color palette. Naturally, animal prints were a lifelong wardrobe staple season after season, leopard being a favorite choice, whether in a bathing suit or a fur coat. 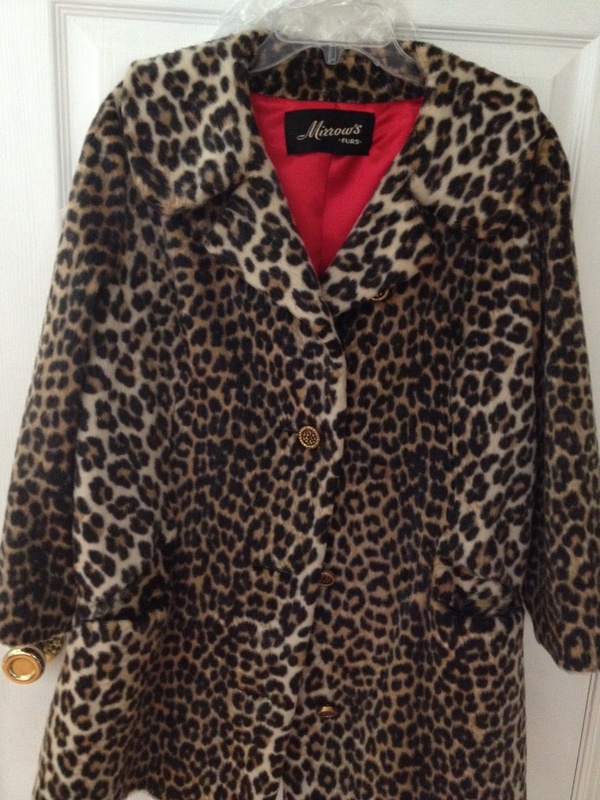 Mom Mom didn’t need Kim Kardashian or Rachel Zoe to tell her leopard was fabulous. I don’t know the story of this coat, or even if it has a story, but I do remember Mom Mom wearing it, hugging her tightly and coming eye to eye with the embossed gold buttons. She didn’t wear it a lot, and it was socked away for years, but I definitely remember her wearing this. When Mom Mom died, as her eldest granddaughter, I inherited this lovely coat. Well, it was more like, “WHO wants THIS THING?” and I jumped all over it, much to the surprise of my conservative aunt and my animal rights activist sister. I should note — before anyone mails me buckets of blood or calls me hateful names — that I love animals, too, and I would never spend money on fur (okay, maybe from a consignment store, but not brand new). If the label is to be believed, it IS real fur, but I can’t imagine actual leopards were killed. I’m thinking it must have been the fur of some poor low-brow animal who was dyed leopard, but I can’t say for sure. One of these days I will try to find out, but it really doesn’t matter to me. For a fairly conservative dresser, I sure hit the ground running with Mom Mom’s coat. I debuted it a couple years ago at my Mad Men party, and since then it has been everywhere with me. Being a mostly stay-at-home-mom, that means the Acme and school conferences and Chick-Fil-A. The black satin lining began to rip more and more, and finally I determined it was time to replace it. I can’t say why, exactly, but I was drawn to choosing either red or emerald green for the lining this time. It just seemed like a Mom Mom kind of a choice. I picked up the coat from the tailor yesterday, and it looks great! I am so grateful to have had a grandmother who was ahead of her time fashionwise, and whose warmth I can still feel when I’m wearing her fur. I only wish she could see me wearing it. This entry was posted in Life and tagged leopard fur coat, November gratitude by Mom Mom's Apron. Bookmark the permalink. That is a great piece of clothing, and vintage besides. I think you are set to go:).